Enjoy your whole day in sporty style and surefooted comfort with the Ghenter - Srelt from Skechers Work®. 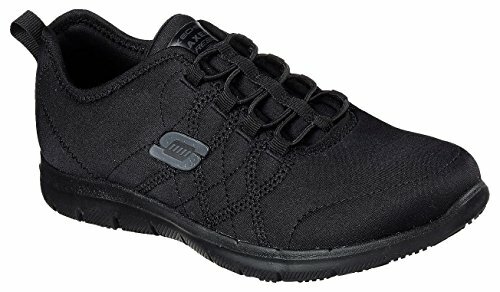 Casual work sneaker features the Relaxed Fit® design for a roomier, more comfortable fit and Memory Foam cushioning. Soft heathered jersey knit fabric upper with water-resistant protection. Bungee stretch lacing for secure lacing or easy slip-on options. Padded collar and tongue for added comfort. Signature stitching accents and side S logo. Rubber toe guard provides added protection against abrasions. Heel panel fabric overlay with pull on top tab. Side gore panels for excellent flexibility and easy on and off. Soft fabric lining offers added comfort. Comfortable footbed with Memory Foam cushioning for incredible all-day cushioned comfort. Flexible, lightweight midsole provides excellent shock absorption. Flexible rubber slip-resistant outsole provides excellent traction. Sole tested with ASTM F1677-96 Mark II standards to meet or exceed a .5 coefficient even on wet and oily surfaces. Imported. Measurements: Weight: 8 oz Product measurements were taken using size 7.5, width B - Medium. Please note that measurements may vary by size.